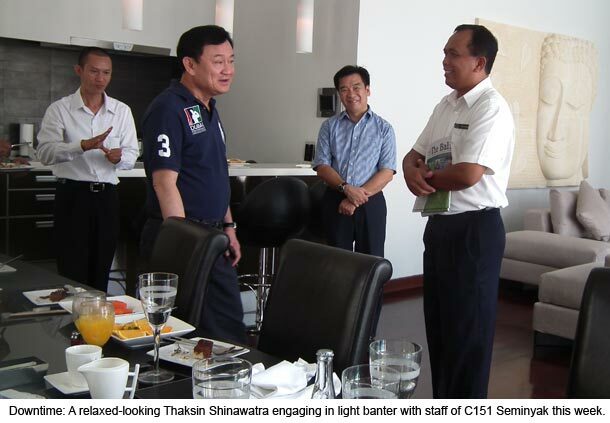 Former Thai prime minister Thaksin Shinawatra, in self-imposed exile from his homeland, held a series of meetings during a three-day stay in Bali this week, The Bali Times can reveal. The billionaire telecoms businessman, whose sister Yingluck became Thailand’s prime minister in July, arrived in Bali by private jet on Monday and departed late on Wednesday. An advance party of aides arrived last Friday to prepare the high-security trip. Thaksin stayed and held the meetings at the presidential villa of C151 Seminyak, a complex of luxury villas, while aides took up five other villas. Among those visiting the former Thai leader were a number of Thais who flew in for the meetings, and his sister Yowvares Shinawatra. Thaksin, who was ousted in a 2006 coup and sentenced in absentia to two years’ prison in 2008 for corruption, said he was “always on business and rarely on holiday.” The 62-year-old had favourite Thai cuisine flown in from his native land – a 4.5-hour flight from Bali – during his stay, and also enjoyed the traditional Indonesian meatball dish bakso. C151 Resorts owner Hanno Soth said Thaksin felt at home in Bali. Last week around 6,000 “Red Shirt” Thaksin supporters took to the streets of Bangkok to commemorate the fifth anniversary of the 2006 coup. Separately, Thailand’s anti-corruption agency said on Wednesday that Yingluck’s wealth amounted to 541 million baht (US$17 million). The National Counter Corruption Commission also said that Yingluck’s husband had debts of 369.7 million baht. The Thai Supreme Court seized $1.4 billion of Thaksin’s wealth in 2010 for abuse of power, estimated to be more than half of his fortune. Meanwhile, Yingluck and her Puea Thai party are considering an amnesty for politicians that may include Thaksin.